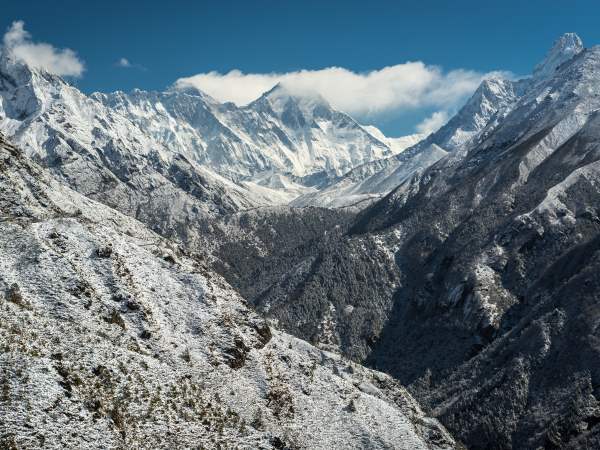 Is Mount Everest Shrinking? Is Mount Everest Growing? The height of Mount Everest, the world’s tallest mountain, continues to garner public interest from all corners of the world. Here’s another quick rundown of the different political and scientific elements associated with the questions. The base of the mountain straddles the Tibet – China – Nepal border, so the politics of the mountain’s height often revolve around national pride and tourist dollars. Over the past few decades climbers have chosen to take either the south side climb from Nepal or the north side climb from Tibet – China. Culture, weather, politics and other factors come into play when making the decision. Regardless of which side of the mountain one starts, the successful climbers who make it to the peak reach a height of about 29,000 feet. The number 29,029 is often quoted as an “official” height. How Do You Measure Mount Everest Height? Ever since it was first measured and given an official height in the mid-nineteenth century, politics and technology have guided the subsequent measurements. (a) Waugh’s value, 29,002 feet, is a spheroidal height. It is too low owing to over-correction for refraction. (b) Burrard’s value, 29,141 feet, is a good spheroidal height. The corresponding geoidal height, 109 feet lower, is 29,032 feet. (c) The present writer’s 29,080 feet, was the first attempt at a geoidal height. The reductions took account of any known deflections and the correction, 69 feet, was the geoidal rise inferred from the geoid in meridians 78o and 88o and, more recently 75o. With the recently found value, -109 feet, it reduces to 29,040 feet geoidal height. (d) Mr. Gulatee’s 2Q,028 feet is a geoidal height, at season of minimum snow, in years 1952-54. It is not to be expected that the height of a snow peak will be invariable over different years and seasons. Today’s estimates are gained using GPS, Global Positioning Satellites that collect data from areas on and around the peak of Mount Everest. The government of Nepal officially sponsored a GPS measurement during the time period of 2017-2019, and those results will stand with earlier GPS measurements. Those numbers will represent the new baseline for discussing the height of Mount Everest. Of course other factors enter the is Mount Everest growing or shrinking debate. For example, researchers hypothesize that the 7.8 magnitude earthquake in Nepal created a seismic event that lowered the mountain’s height. Long term, the plate tectonic activity of the Indian Plate bumping into the Eurasian Plate, thereby creating the Himalaya mountain range continues. Invariably the mountains will rise as the plates continue to move. The Hindu Kush Himalayan region is the location of several of Asia’s great river systems, which provide water for drinking, irrigation, and other uses for about 1.5 billion people. Depending on the rate of melt, in fifty to one hundred years, those people lose a water source they have depended on since the dawn of man in the region.